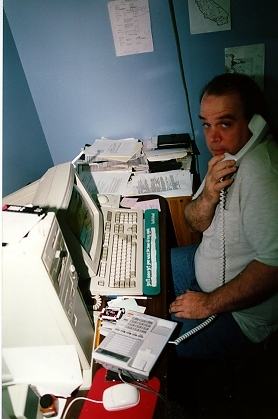 A typical Rich P. White snapshot from the "Old Days": Rich at his computer. Notice the green wristpad, the trackball, and the chair, all of which are famous in Best Lore. Towards the bottom you can see the 3 line phones we used to use, which handled all calls for a long time. On the wall is the list of our POP numbers. Rich is responsible for personally creating several thousand of our first customer's accounts. A shot from the inside of the Castro store. 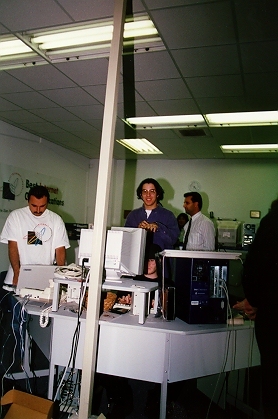 From left to right, Sam Habash, Arian Hormozi, and Harley Davidson (bottom), at a tech support "pod". The phone you see towards the left was the newer model we received, with 5 lines for tech support. It was one of the most annoying rings I can remember from any phone. Harley is logged into his personal computer. Back in the old days, many of us had our personal machines at Best. 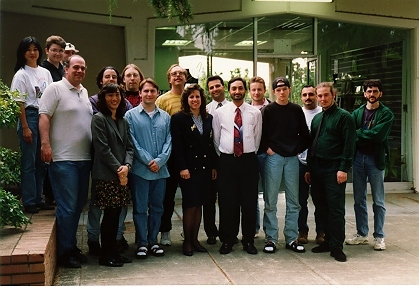 A group photo of the castro site team before moving to Middlefield.